The Super Bowl Fever is strong with us here at Chunky Apps as we’ve introduced not one, but TWO new games to our line up in the last few days! First up is our take on what is bound to go down as the strangest controversy in NFL history… Deflate-Gate. Whether it was the evil genius himself Bill Belicheck or Golden Boy Tom Brady, we may never know. What we do know is that this “conspiracy” is ripe to be made fun of. 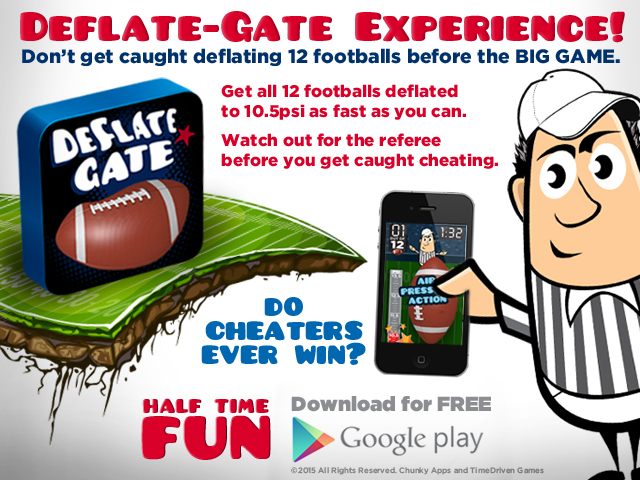 So we hunkered down and created “The one true Deflate-gate Experience” for our loyal fans. Now you can participate in deflating footballs as if you were the anonymous New England Patriots’ assistant equipment manager who is set up to take the fall. Deflate-Gate is available on Google Play this very moment as a FREE download and will be available for your iPhones & iPads as soon as the good folks at Apple review it. Next up, but certainly not least, is Fantasy Night Football – Championship Edition. This is the game you all know and love but now you get to play as one of the two Championship teams. Download now for free and create your own Super Bowl halftime entertainment. Fantasy Night Football – Championship Edition is available as a FREE download for iOS and Android! As always, thank you for your support and be on the lookout for more games from Chunky Apps!